Watsons Sun Warrior ambassadors Yassi Pressman and Dominique Roque led the way to be a Sun Warrior and pledged to be bold, brave, and always sun-protected. Other Sun Warrior guests include triathlete Kim Atienza and TV host Karylle Tatlonghari-Yuzon who also bravely took the challenge: keeping skin protected under the sun, running the 3k route and obstacles, and dancing and partying with colors during the sunny Sunday morning. Covered in colored powder, Sun Warrior Karylle had a lot of fun during the Watsons Sun Warrior Challenge. Triathlete Kim Atienza is one of the Watsons Sun Warriors who took the challenge of being sun protected for the Color Manila running tracks and obstacles. Watsons Sun Warrior ambassadors Yassi Pressman and Dominique Roque led the challenge to become a Sun Warrior and pledged with all 5,275 runners to be bold, brave, and always sun-protected. Ultraviolet (UV) radiation from the sun is the major cause of skin cancer. Exposure of skin under the sun is pummeled by invisible rays that can cause your skin to darken and burn. But the good news is that you can reduce risk of getting skin cancer by protecting yourself from the sun’s UV rays. Protecting your skin from it does not mean you have to stay indoors all the time, because being a Sun Warrior means anyone can still enjoy outdoors under the sun. “A SunWarrior, to me, is someone who is unafraid to go under the sun, enjoy the outdoors, and just have fun,” says resident Sun Warrior Yassi Pressman. “For me a Sun Warrior is someone who is not afraid to try out new adventures with friends, family, and someone who is just game for everything,” add Dominique Roque. How does one become a Sun Warrior like Yassi and Dominique? Here are three exciting ways from Watsons. 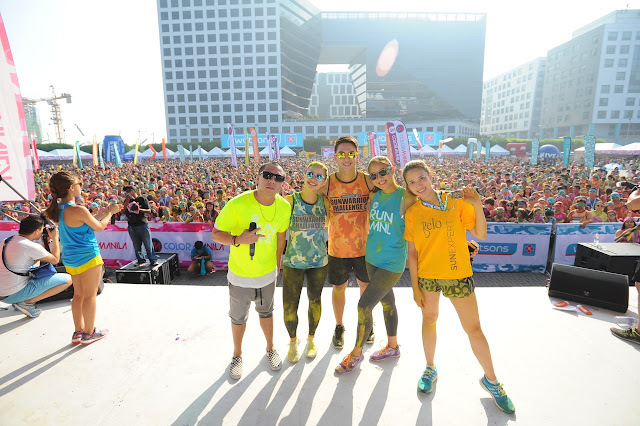 Watsons Sun Warrior Challenge + Color Manila with Sun Warrior DJ, ambassadors Yassi Pressman and Dominique Roque together with Karyll and Zara Carbonel pumping up the crowd for the most colorful run after-party at the SM Mall of Asia Grounds. Beating the world record with 5,275 runners with sunblock protection before taking the running tracks under the basking sun. 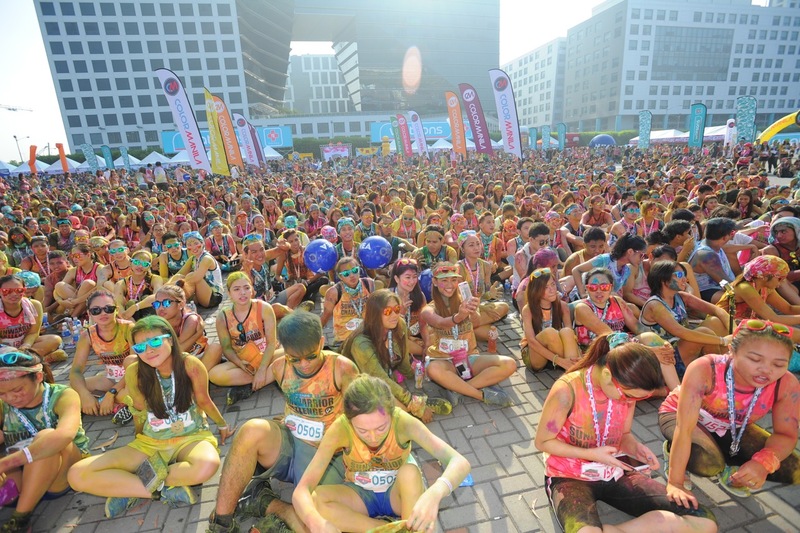 Watsons Sun Warrior Challenge + Color Manila fun run after-party created the most colorful event. Watsons Sun Warrior runners gave importance to sun screens for keeping skin healthy and beautiful. • Include sun protection in your everyday routine with amazing products like Belo’s Sun Expert Tinted Sunscreen SPF 50, Dermplus Moisturizing Sunblock Extreme 80, Cetaphil SPF 69, Kojiesan SPF 69, and Celeteque Dermosicence Sun Care Face and Body Defense Cream SPF50. Going beyond protection, Olay Natural White prevents the formation of dark spots caused by the sun, giving you fairness that glows; while Vaseline’s Healthy White SPF 30 provides three layers of protection that helps keep skin fair and even toned. Ponds BB Cream is your solution to a brightening foundation cream with UVA and UVB protection; while Neutrogena’s Ultra MD Body Lotion SPF 100 is fast absorbing, water resistant, and lightweight, and infused with a light, fresh scent. • For an active day out, get your full sun protection from Nivea Sun Whitening Sun and Collagen Protection SPF 50, Biore UV aqua Rich SPF 50, Sunplay Ultra Shiled SPF 130, Banana Boat Ultra Protect Sunscreen Lotion, Hawaiian Tropic Sheer Touch SPF 50, and Neutrogena Ultra Sheer Dry Touch Sunblock SPF 50. Of course there’s DWatsons SunCare, a gentle, fragrance free sunscreen specially created for sensitve skin. • Make sure to reapply sunscreen to get that full sun protection. Just remember that while sunscreen can protect you from the sun’s harmful UV rays, a lot of its active ingredients can break down over time. Watsons will also be offering an exclusive summer promo for SM Advantage, SM Prestige and BDO Rewards cardholders. Sunscreens and skin care range are available in all Watsons Stores and SM Store Beauty Sections. Watsons is Asia’s leading health and beauty retailer, currently operating over 4,000 stores and more than 1,000 pharmacies in 12 Asian and European markets. Watsons continually sets the standards in the health, wellness and beauty market, providing personalized advice and counseling in health, beauty and personal care on top of its market-leading product range, making customers LOOK GOOD, FEEL GREAT every day. Since 2009, Watsons has been the No. 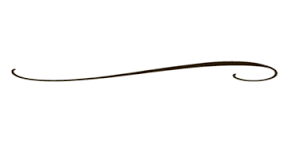 1 pharmacy/drugstore brand in Asia*.